Researchers from Rensselaer Polytechnic Institute have developed a new nanotechnology-based "microlens" that uses gold to boost the strength of infrared imaging and could lead to a new generation of ultra-powerful satellite cameras and night-vision devices. 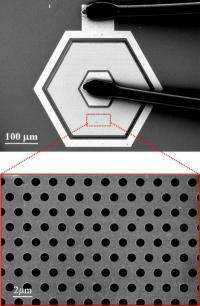 By leveraging the unique properties of nanoscale gold to "squeeze" light into tiny holes in the surface of the device, the researchers have doubled the detectivity of a quantum dot-based infrared detector. With some refinements, the researchers expect this new technology should be able to enhance detectivity by up to 20 times. This study is the first in more than a decade to demonstrate success in enhancing the signal of an infrared detector without also increasing the noise, said project leader Shawn-Yu Lin, professor of physics at Rensselaer and a member of the university's Future Chips Constellation and Smart Lighting Engineering Research Center. "Infrared detection is a big priority right now, as more effective infrared satellite imaging technology holds the potential to benefit everything from homeland security to monitoring climate change and deforestation," said Lin, who in 2008 created the world's darkest material as well as a coating for solar panels that absorbs 99.9 percent of light from nearly all angles. "We have shown that you can use nanoscopic gold to focus the light entering an infrared detector, which in turn enhances the absorption of photons and also enhances the capacity of the embedded quantum dots to convert those photons into electrons. This kind of behavior has never been seen before," he said. Results of the study, titled "A Surface Plasmon Enhanced Infrared Photodetector Based on InAs Quantum Dots," were published online recently by the journal Nano Letters. The paper also will appear in a forthcoming issue of the journal's print edition. The U.S. Air Force Office of Scientific Research funded this study. The detectivity of an infrared photodetector is determined by how much signal it receives, divided by the noise it receives. The current state-of-the art in photodetectors is based on mercury-cadmium-telluride (MCT) technology, which has a strong signal but faces several challenges including long exposure times for low-signal imaging. Lin said his new study creates a roadmap for developing quantum dot infrared photodetectors (QDIP) that can outperform MCTs, and bridge the innovation gap that has stunted the progress of infrared technology over the past decade. The surface plasmon QDIPs are long, flat structures with countless tiny holes on the surface. The solid surface of the structure that Lin built is covered with about 50 nanometers - or 50 billionths of a meter - of gold. Each hole is about 1.6 microns - or 1.6 millionths of a meter - in diameter, and 1 micron deep. The holes are filled with quantum dots, which are nanoscale crystals with unique optical and semiconductor properties. The interesting properties of the QDIP's gold surface help to focus incoming light directly into the microscale holes and effectively concentrate that light in the pool of quantum dots. This concentration strengthens the interaction between the trapped light and the quantum dots, and in turn strengthens the dots' ability to convert those photons into electrons. The end result is that Lin's device creates an electric field up to 400 percent stronger than the raw energy that enters the QDIP. The effect is similar to what would result from covering each tiny hole on the QDIP with a lens, but without the extra weight, and minus the hassle and cost of installing and calibrating millions of microscopic lenses, Lin said. Lin's team also demonstrated in the journal paper that the nanoscale layer of gold on the QDIP does not add any noise or negatively impact the device's response time. Lin plans to continue honing this new technology and use gold to boost the QDIP's detectivity, by both widening the diameter of the surface holes and more effective placement of the quantum dots. "I think that, within a few years, we will be able to create a gold-based QDIP device with a 20-fold enhancement in signal from what we have today," Lin said. "It's a very reasonable goal, and could open up a whole new range of applications from better night-vision goggles for soldiers to more accurate medical imaging devices." could this be used with a Phase Conjugate Tracking System? Could this be used in the infrared scanners at airports? equipment is finalized for the Webb so no. as for the other two this technology definitely has an opportunity to enhance all kinds of areas of science!